Unless otherwise stated, this article uses dates from the Gregorian calendar (new style), in preference to the Swedish or the Julian calendar (old style) which were used simultaneously. The Battle of Lesnaya (Russian: Битва при Лесной Bitva pri Lesnoy, Swedish: Slaget vid Lesna, Polish: Bitwa pod Leśną), was one of the major battles of the Great Northern War. It took place on September 28, 1708 (O.S.) / September 29, 1708 (Swedish calendar) / October 9, 1708 (N.S.) between a Russian army of between 26,500 and 29,000 men commanded by Peter I of Russia, Mikhail Mikhailovich Golitsyn, Aleksandr Danilovich Menshikov, Christian Felix Bauer and Nikolai Grigorovitj von Werden and a Swedish army of about 12,500 men commanded by Adam Ludwig Lewenhaupt and Berndt Otto Stackelberg, at the village of Lesnaya, located close to the border between the Polish–Lithuanian Commonwealth and Russia (now the village of Lyasnaya, south-east of Mogilev in Belarus). The Swedes were escorting a supply column of more than 4,500 wagons for their main army in Ukraine. Destruction and capture of most Swedish wagons, along with all artillery. Neither side broken. Swedish force allowed continued march towards the main army under Charles XII. Peter I intercepted Lewenhaupt's column before it reached the safety of Charles XII, the Swedish king, with the intention of destroying it. After eight hours of fighting, with heavy casualties, neither side stood as winner. As the night approached the Russians decided to withdraw to the nearest forest where they would stay until next morning to continue the fight. The Swedes however stayed in their battle formations for hours during the night, in case of a renewed attack. With no sign of further combat and intelligence saying further Russian reinforcements had arrived, the Swedes in turn withdrew from the place of battle, in order to continue the march towards the main army. Fearing a full-scale Russian pursuit, Lewenhaupt decided to burn or abandon most of the wagons and cannons in order to increase speed. While doing this many of the Swedish soldiers decided to loot the abandoned wagons and get drunk, thousands got lost in the woods, many of whom fell victim to Russian irregular cavalry. Lewenhaupt soon crossed the river of Sozh with the rest of his army, to find himself relatively safe. After some days he met up with Charles XII at Rukova with very few wagons left and only half of his initial army. The two soon continued their march towards Ukraine, eventually finding themselves at the battle of Poltava and the surrender at Perevolochna which severely crippled the Swedish army and is known for being the turning point of the war. Adam Ludwig Lewenhaupt (1659 – 1719), Riga governor, by David von Krafft. Peter the Great (1672–1725), Russian tsar, by Paul Delaroche. Initial positions in the battle of Lesnaya 1708. Russians in red; Swedes in blue; Swedish wagon train in orange. Battle of Lesnaya by Jean-Marc Nattier, Russian army forcing the Swedish outpost out of the forest towards Lesnaya. Campaigns in the Great Northern War and the Swedish invasion of Russia. Battle of Poltava ending the Swedish invasion of Russia. Monument raised on the 200th anniversary of the Russian victory over the Swedes. The estimated number of casualties sustained by both sides during the battle varies widely, depending on the source. Einar Lyth and Pavel Konovalchuk make an estimation calculated out of these numbers in their book "Vägen till Poltava. Slaget vid Lesnaja 1708 (The road to Poltava. The battle of Lesnaya 1708)" using the initial strength presented by Petre of 13,000 men, which concludes up to 4,000 Swedes killed, captured or dispersed in total, during the battle and the days after and no more than 2,500 men killed or captured in the battle itself. Using the same calculation on the number of 12,500 Swedes presented by Dorrell, the total losses would amount to 3,500 men and 2,000 in the battle and on the road towards Propoisk (similar estimation to that of Weihe), applying a rough estimation of 1,000–1,500 wounded to this number, representing the large numbers of wounded left at Propoisk and the ones being wounded while marching back towards Sweden, there's a possibility that the Swedes suffered 3,000–3,500 men dead, wounded and captured in the battle alone. :231–233 Another estimation is made by the Russian historian Vladimir A. Artamonov in his book “The Dawn of the Poltava Victory: The Battle of Lesnaya”, where the author estimates the Swedish casualties at 3,873 dead and wounded in the battle and another 877 captured afterwards, totaling losses of 4,750 Swedish soldiers, also here, using Petre's number of 12,950 Swedish soldiers as the basis for the calculation. Swedish official reports declared that more than 20,000 Russians died in the battle, which is considered to be a highly unlikely number by most authors. Lewenhaupt initially estimated more than 6,000 dead and wounded Russians during the battle, but later increased that number to 9,000 dead and wounded, claiming that this estimate was reported to him by Russian officers, while he was in captivity in Moscow. :229–235 Artamonov questions the reliability of this claim. Another Swedish source, Gustaf Adlerfelt, a court historian of Charles XII, declared that the Russians lost 6,000 men killed and many more wounded, referring to the "confession" of a captured Russian Adjutant-General named Schultz. ^ Estimation using Dorrell's numbers of Peter's 15,000–17,000 men, Bauer's 5,500–6,000 men (20,500–23,000), with Artamonov's estimation of 6,200 infantry (26,700–29,200) under Werden. ^ В. А. Артамонов. Заря Полтавской победы – битва при Лесной. ^ Frost, Robert I (2000), The Northern Wars. War, State and Society in Northeastern Europe 1558-1721. Longman. Konovaltjuk & Lyth, Pavel & Einar (2009). Vägen till Poltava. Slaget vid Lesnaja 1708 (in Swedish). Svenskt Militärhistorisk Biblioteks Förlag. ISBN 978-91-85789-14-6. History of the Art of War – История военного искусства / Под общ. ред П.Д. Ротмистрова. — М., 1963. – T.I. – С. 132-135. History of the Northern War – История Северной войны. 1700—1721. / Отв. ред. И.И. Ростунов. — М., 1987. С. 73-76. The Book of Mars or of Affairs of War – Книга Марсова или воинских дел. — Изд.2. — СПб., 1766. Kresnovsky's History of the Russian Army, from Narva to Paris: 1700-1814 – Кресновский А.А. История русской армии: В 4-х т. — М., 1992. — T.I. От Нарвы до Парижа 1700—1814. — С. 35—36. 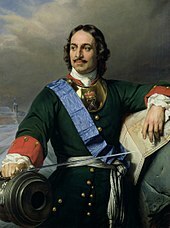 Letters and papers by Emperor Peter the Great – Письма и бумаги императора Петра Великого. — Т.5. — СПб., 1907. Soviet War Encyclopaedia – Советская военная энциклопедия: В 8-й т. / Гл. ред. комис. Н.В. Огарков (пред.) и др. — М., 1977. — Т.4. — С. 624. Strokov's History of the Art of War – Строков А.А. История военного искусства. —М., 1955. —T.I. — С. 496. Военный энциклопедический лексикон. СПб. Часть 8. 1844.